Camp Bow Wow Plano dog training services are specially designed to enrich your pup. Our premier dog training services offer flexible programs for every dog. The training methods we use are designed using only reward-based techniques to ensure your pup has the most fun learning experience. Our programs are exciting, effective, and enrich canines of all ages and behavior levels. One of our Camp Bow Wow Certified Trainers will work to design a program that meets your needs and your schedule. Contact Camp Bow Wow at (469) 331-6223 to schedule a session! Camp Bow Wow Plano offers several options for our canine training. Our Certified Trainers can work with your dog while they attend Camp, spending one-on-one time with them. We can also provide training services working with you and your dog in a private setting if that’s most comfortable for you. These sessions can help your pup overcome behavior issues or provide enrichment. 6 week, 1-hour class. Dogs 10 weeks - 4 months. Age appropriate vaccinations required. Basic manners, behavioral shaping and modification. 6 week, 1-hour class. Dogs over 4 months. Vaccinations required. Basic manners, behavioral shaping and modification. 6 week, 1-hour class. Prerequisite of Level I. Advanced behaviors like heel, place, and handling distractions. 6 week, 1-hour class. Prerequisite of Level II or trainer approval. Intense focus on solidifying desired behaviors. Can be used as prep for CGC test. 4 week, 1-hour class. Prerequisite of Level I or trainer approval. This is a quick, 15-minute session to meet the trainer and discuss the various training options available. (Sessions available on selected evenings at Camp during Day Camp pick up.) Session prices are in addition to Day and Overnight Camp rates. Campers attending in-Camp training must first pass our initial Camper Interview. 30-minute session to meet the trainer, discuss desired behaviors & training goals, and develop a plan of action to meet those goals. Session prices are in addition to Day and Overnight Camp rates. Campers attending in-Camp training must first pass our initial Camper Interview. 1 hour Initial Consultation: This critical meeting employs holistic diagnostic techniques to determine the root cause of undesirable behaviors you want addressed. 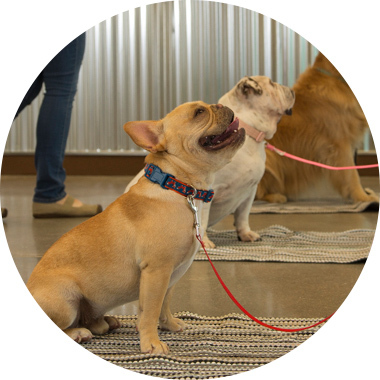 Dani will discuss with you the history of your dog's behavior, identify problem behaviors, provide detailed advice for immediate management, and establish a plan for achieving your goals. Includes the first hands-on training exercise.The initial consultation is not mandatory, but is highly recommended. 30-minute training sessions while your pup is at Day Camp. New exercises will be videotaped periodically and sent to pet parents for independent reinforcement at home. Each 30-minute session is followed by a 1-hour nap. Session prices are in addition to Day and Overnight Camp rates. Campers attending in-Camp training must first pass our initial Camper Interview. Ten 30-minute training sessions while at Day Camp. Perfect for the parents of regular Day Campers; saves time and money! Includes periodic videotaped sessions and a 1-hour nap. Session prices are in addition to Day and Overnight Camp rates. Campers attending in-Camp training must first pass our initial Camper Interview. One 30-minute private training session with owner & dog. Session prices are in addition to Day and Overnight Camp rates. Campers attending in-Camp training must first pass our initial Camper Interview. This 1-hour session will target one desired behavior, employing 2 - 3 specific exercises to achieve your goal. These 1-hour sessions will target 1 - 3 desired bahaviors, employing multiple exercises to achieve your goals. Your dog will begin to apply learned behaviors to a variety of real-life experiences outside the home. These 1-hour sessions represent a long-term commitment to resolve not only specific problem behaviors, but to building a variety of solid foundational behaviors. Additional 30-minute increment to be added to any 1-hour in-home training session. For travel up to 15 miles outside CBW Plano standard service zone (75023). One-hour group seminar (humans only) to help educate pet parents on common behavioral challenges such as potty training, jumping, etc.